A staggered junction is where a minor road meets a major road, but unlike a crossroads where the minor road continues directly opposite the major road, the points that the minor road meet the major road are slightly offset (out of line) by a short distance. Staggered junctions provide many benefits. They are safer as they force a motorist to slow down or stop before continuing to cross, visually they provide a distinct T-junction style on approach instead of a continuation of road making it safer. At busier light controlled junctions, a staggered junction can provide better traffic flow and will also have less condensed ‘conflict points’ where vehicles meet each other, cyclists and pedestrians. 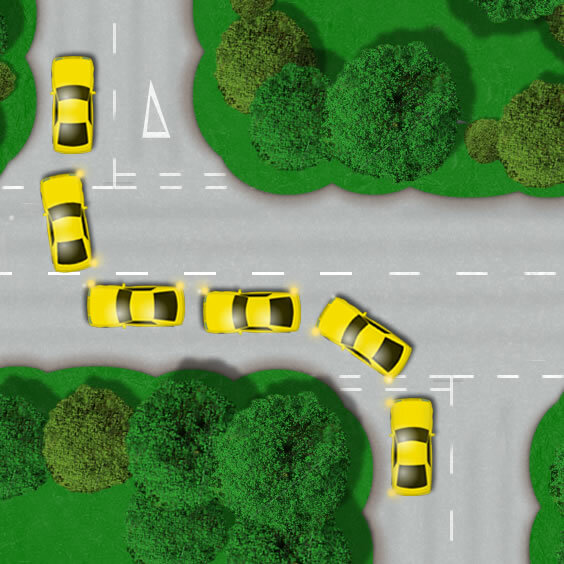 This tutorial explains what staggered junctions are with the use of diagrams and how they should correctly be used. 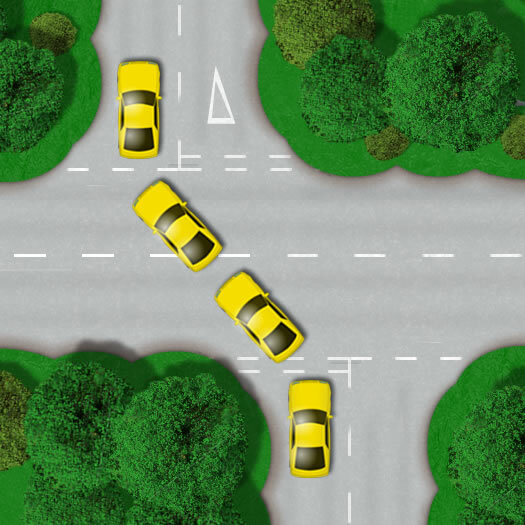 Staggered junctions can cause a little confusion among drivers and especially learner drivers in terms of road positioning and indicating. The distance from where the minor road meets the major road and where the minor road exits the major road varies. Indicating at staggered junctions where you are on the staggered road depends on the distance apart the minor road meets and exits the major road. In this diagram of a staggered junction, the distance between the minor road meeting and exiting the major road is only slight. There is little reason to indicate. When entering the major road, your will need to plan the manoeuvre as though you were crossing a standard crossroads as there is not enough room to stop and take up road position on the major road and wait to exit back onto the minor road. Indicating left and then right would take your attention away from the road and would also perhaps compromise your steering in with such a short distance. Indicating to the left as you meet the major road may also be confusing to other motorists. For example a driver on the opposite minor road wishing to turn to their right would likely see the left indicator as your intention to turn left onto the major road and not to re-enter the minor road. Both lanes of the major road will need to be safe to cross before proceeding. The meeting point and exit point on the diagram of this staggered junction are offset at a greater distance. On this occasion you would need to enter the major road and take up road position for a right turn to re-enter the minor road. See left and right turns for this procedure. This would not be a single manoeuvre as the staggered junction above and will require individual MSM (Mirror Signal Manoeuvre) and MSPSL routines. Unlike the junction above, you can enter the major road if the first lane is clear of vehicles or has enough distance from approaching vehicles to safely enter the lane and wait in the lane to exit the minor road once again. This distance is of course relative to the speed limit of the major road. It can of course be difficult to know when and when not to indicate at a staggered crossing before you get there. There are no definitive rules for indicating at staggered junctions as such, so it’s generally down to the motorists to establish the safest course of action. Generally, as you approach the staggered junction, if you can clearly see the exit road on the opposite side of the major road, treat it as following the road ahead at a standard crossroads and it will not be necessary to indicate. If you do not see the exit road, the best action to take is to indicate and to treat it as a separate junction. Whilst on the minor road and meeting the major road, you will likely see give way or stop signs if traffic lights are not present. See junction signs for the various types of signs that tell a motorist a junction is ahead. 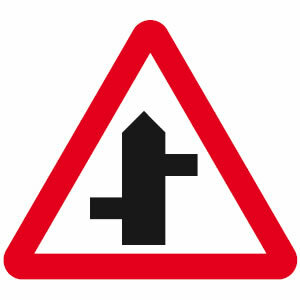 If on the major road, you may see a staggered junction sign such as the one below. please who has the right of way when turning right in the second diagram above? is it the vehicles already on the major road driving straight ahead or the car crossing the staggered road already trafficating and about to turn to the right? The vehicles already on the major road driving straight have priority. If a vehicle ever needs to cross a lane or path of another vehicle, then they must give way (unless there are signs or road markings stating otherwise). At the point where both cars are waiting at their junction lines, no one has priority. It’s simply a matter of who enters the main carriageway first will then have priory over the other.